Gemini Pronto™ Modern Letters, Numbers and Punctuation Modern font is more squared and bold, setting your readerboard message apart from other businesses on your street. Starting at only $.93 each. 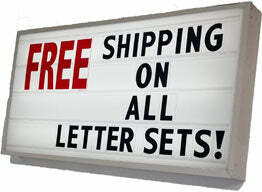 Buy a Full Sign Letter Set to Save 15% & Receive FREE SHIPPING! Does not apply to Flexible Full Letters Sets. Self Spacing- Letters slide together for perfect spacing every time. Color – Available in a variety of colors. keep it from freezing to the sign tracking. Durable – Rigid 0.060 acrylic will last and won't blow out of the track. Letter Sizes – Wide range of sizes perfect for any sign. Not sure how many letters you need? This plastic, changeable sign letter is designed to be used with acrylic tracking and a letter pole. Letter poles enable you to change your sign message quickly, from the safety of solid ground. Don't risk it! Never use a ladder to change your sign message. If your letters are slipping and falling off your sign, replace your tracking. Sign Letter tracking comes in four lengths, 6 ft, 8 ft, 10 ft, and 12 ft. The Letter Height is the measurement of the letter by itself. The Panel Height is the measurement of the entire plastic panel. First choose a color above to see which characters are available. Then below each letter, enter the quantity you would like to order. Note: the letter I and the number 1 in this font are visually identical. Our convenient set choices save you time! - The 250 piece set gives you all the letters and numbers needed for your readerboard. - Just Need to fill in your existing supply? The 100 Piece Set provides you a bit of everything. - Punctuation Matters! Be sure your sign says what you mean. Our punctuation set has the essentials for emphasizing your message. See below for exact character count details. Receive 15% off when you buy a 250pc. Full Set. Instantly. Discount applies to online orders of 250pc. Full letters sets only. Does not apply to Flex Letter Sets or phone orders. WOW! 'A Picture is worth a thousand words,' and that's definitely true when you put a beautiful back lit sandwich on your readerboard. The package from NRS installed easily and looked great! Last month we sold over 12,000 Coney Island's compared to 3700 the year before in May. You guys are great!!! Our sales DOUBLED when we used these specialty panels over the regular black letters for this hamburger promotion. The full color panels from National Readerboard were exactly what we needed. We saw an immediate increase in product movement. We got our order fast, they installed easily, and the customer service has been outstanding every time we place an order. We are very pleased and highly recommend buying your readerboard P.O.P. 's from NRS. This company is great to work with. I have never been disappointed!! My order was received a few days after I had ordered, exactly right and in great condition. My trust is with NRS. Thank you. Thanks for the super fast service, keep up the good work! Thanks for your VERY QUICK service last week. There is another supplier closer to us, but their prices were much higher. They told me that I could get the letters for a discounted price if I pre-paid or ordered COD. They just didn't go after my business. Again, Thanks. Pam assisted me in my last order and she responded with order ASAP. Great customer service. Hey, I thought I would let you know, our Brazier sales for August of this year (all food) are up 33% over last August. I'm sure that the Grillburger Marquee Graphic is pushing this. Thanks so much for the great graphic. It really adds a new dimension to our reader-board. Our goal was to increase food sales and this really worked well. Our food sales increased over 30% during the time we had the graphic up. I don't see how we can go wrong. I've been in the DQ business for over 35 years and I think I have a good feel for what works and what doesn't. This one works! I thought I would share with you how AWESOME the McGriddle panels look! They are the best yet! Our Osceola store was the first to install their panels on Wednesday the 25th. They normally are moving an average of 130 a day. However, on Friday the 27th, they sold a total of 348 McGriddle Sandwiches for breakfast! A record breaker for the region! The day after we installed the [Marquee Graphics] kit, our sales jumped 224% and have stayed up. Within a week, our store owner came by because our store’s sales were the highest in our region. Upon seeing the Marquee Graphics kit, he promptly asked me to order for all the stores in our system. Now sales are up in every store! Thanks again for all of your help. We needed to sustain our product line percentage of sales after media advertising. The marquee panels did a great job of keeping the message in front of consumers and help keep our product mix well above the previous percentages. Thank you, very satisfied with prompt service & no minimum order and great price. I couldn't believe how fast we got our order. The very best service I've found in 29 years! You really stand by your promise of 100% satisfaction, I am extremely impressed, your company really stands out! I feel your customer service is OUTSTANDING!